1) Geography matters. You will ideally be in a location, like Tromso, that is in the belt of northern light activity. 2) Clouds block the lights. There are no northern lights under the clouds. You need clear skies. Once you have tackled the geography issue, you need to find clear skies. Assuming you don't already have them, you need to travel to a location that does. Tromso is a bit of a cloud magnet, but the islands (Sommaroy) nearby or the Lyngen Alps (also nearby) are typically more cloud-free. A little advance research on normal weather in the area you're considering will go a long way in assisting your accessibility to clear skies. 3) Light pollution is an obstacle. While there may be displays which are sufficiently bright to be seen even with the interference of city lights, I'd say they are more rare and not to be counted upon. If you can see tons of stars and there are virtually no competing light sources, you're in a good viewing spot. In most places sufficiently north to see the lights, you probably won't have to drive long to have adequate darkness. 4) Time of day. Each zone has their optimal viewing hours. That said, they are quoted as after 6pm for Tromso. Yet we had a killer viewing session at 3:30pm (already dark) near the island of Sommaroy, just outside Tromso. To see this display required me looking at the sky as we left a restaurant, and drive back toward Tromso until we had dark skies. Pretty simple. The photo at the top of the page came from that session. 5) Luck is mighty handy. In the course of a few minutes the lights can go from barely noticeable, to stunning, to nothing. As a result, you need to be "in the game" to optimize your chances. Any number of outdoor activities can accommodate this, as can simply having a drive and having an occasional glance at the sky (while parked). 6) Have other activities to enjoy in an area will make a stay much more fun. In addition, it takes some of the pressure off seeing the lights. We were quite fortunate to see them every evening, but if we hadn't seen them at all, we enjoyed our day trips photographing the area in the daylight enough to justify our trip. 7) If it's not already obvious, you need to rent a car, unless you're going to hire a guide. Having a car gives you tons of flexibility as well as an opportunity to do other exploring as well. Getting a guide is basically outsourcing the transport and geography work. But bear in mind...there are no magic spots. This is not fishing. However, if you aren't comfortable driving in an unfamiliar place, or trying to track down clear skies, you may feel warranted in paying to have someone help you. Bonus tip: If you plan on photographing the lights you will need a tripod (and mountable camera). Ideally one that can be weighted down in case conditions are windy. Good luck. It is a pretty amazing experience. Enjoy. Hey Dad, you're fired. How giving my dad the big adios began my real biz career. As a kid I used to do all sorts of work around the neighborhood. There was decent money in doing the drudgery the adults weren't interested in. One element of my "empire" was a lawn mowing business which included a variety of clients both young and old. Usually the young people were too busy, or too lazy, to do it themselves. The older people had often reached an age where it wasn't probably a great idea to be operating heavy equipment. In the middle of this range was my dad. An aerospace engineer with a crew cut, a man who proudly wore his pocket protector complete with mechanical pencil. He could mow the lawn, but I guess he figured he'd let me do it since he was paying me virtually nothing. Things went along pretty well for about a year like that. Then I got to thinking. In general, I spent more time messing with my dad's yard than any other client. Completely unlike my other clients he complained constantly; regardless of how painstaking I was in my efforts. The crowning blow was the paltry sum he was paying me. It was less than half what any other client paid. The day was approaching for me to confront my dad. Soon I would be due to cut the lawn, and I had decided it wasn't worth it to be paid peanuts by my most persnickety client. Finally I approached him and said, "Dad, I'm not cutting the grass anymore." Well, I tried in any event. This opened a discussion which included his thrift, my mowing abilities, his excessive criticism, and a range of other things. Fortunately, we managed to keep it civil. In fact, it lead to an awesome lesson for me. By being willing to face the music of dismissing him as a client, I managed to renegotiate the price, and reset his expectations. Two things that matter greatly to me, and I think he walked away satisfied as well. For me the central lesson was that you get what you ask for, not what you hope for. Nobody cares a stick about your silent suffering. No super heroes are coming to rescue you. You'll have to set yourself straight. By asking for what you want you have a much better chance of getting it. If you're willing to walk because the other party won't acquiesce, you chances are even better. Over the years, the lessons of that day have served me well. 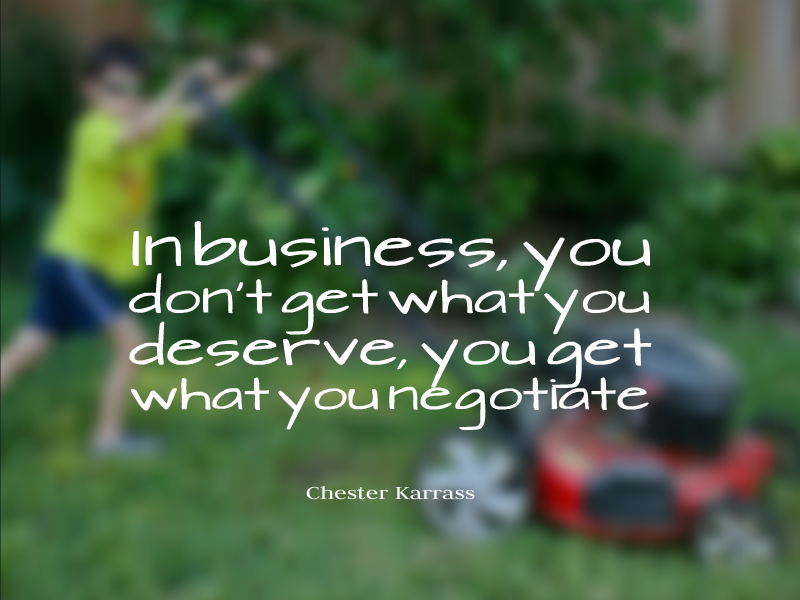 From negotiating with clients to discussions with my kids, being clear about what you want and what you're willing to give provide a framework for all parties to walk away from the table satisfied. Luckily, you probably don't even need to fire your dad to figure that out. Like many quotes, this one from Oscar Wilde is easy to say, and casually think "Sure, that's me". I'd say being yourself requires an incredible amount of energy. The forces of the universe conspire against you. Without knowing it, we conform in ways both large and small. When we buy a brand of any type, or expound particular beliefs, how was the decision really made? In fact, being yourself requires a conscious effort to examine the beliefs that dictate the lifestyle we lead, the lunch we'll eat, the vacation we take, the candidate we'll vote for in an election. For each of these, there is likely someone with a vested interest trying to influence you. How to fight it? Only by deciding conciously what you'll do. Even then, the myriad of influencers swirl around in such abundance it is hard to know where reality ends and spin begins. Will Rogers summed it up, "Too many people spend money they haven’t earned, to buy things they don’t want, to impress people they don’t like." So the problem isn't new. If you consistently ask yourself if what you are doing is important to you that might be a start. Everything hinges on your ability to be honest with yourself. If you can do that, you are on your way. The rewards are fantastic once you get past the darting glances. There is nothing people have more trouble with than looking in the mirror. By being yourself you confront their anxiety over the same issue. Don't wait for thank you cards. You won't get any. Instead thank yourself for stepping off the treadmill. Living your life on your terms is something to be truly grateful for. Enjoy it. But keep a wary eye on yourself. You can change, but the world won't stop trying to lure you back. Up early, sun shining, a breeze blowing and not a cloud in the sky. The potential of the day awaits. Everyday has the possibility of being absolutely life changing and fantastic. Or just "another" day. In the end, it will most likely be something in the middle. But we won't really know until later. Must steer the ship carefully.